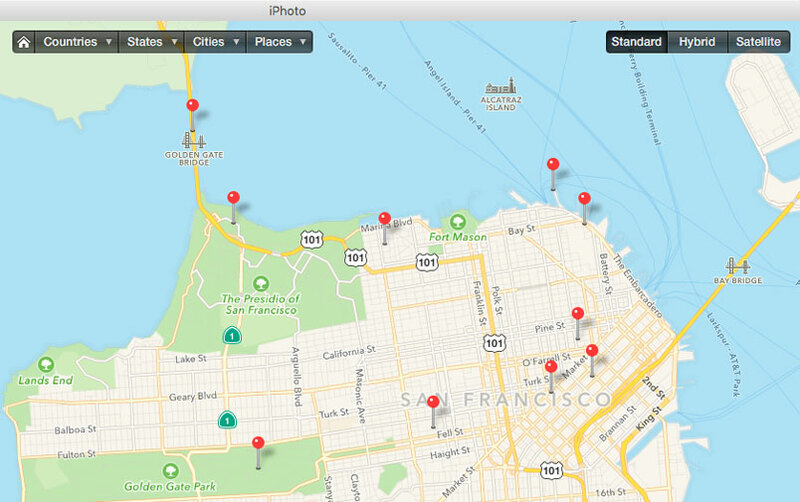 Geotags create a permanent record of where a photo was taken. They allow photo cataloging tools like Apple Photos, Aperture, iPhoto, or Adobe Lightroom to organize photos by location. Years from now, you may not remember when you took the photo you are looking for. But you will remember roughly where you took it. Sometimes, you need to find a good picture of a specific spot. For example, you want to illustrate a blog post on the Golden Gate Bridge. Over the past years, you’ve visited the site several times and took a lot of different pictures. In this case, searching by date will prove arduous. Consulting a map with all your images represented by pins is a lot more efficient. Geotags add to the “story” of a photo. A photo pinned to a map – at the exact spot where it was taken – has context. A series of tagged photos documents the path taken. There are several options to share your photos with their geoinformation. Google Photos and Flickr for example can show their location an map. With Google My Maps or Google Earth, you can display a series of photos pinned to their locations. Photos taken with iPhone are geotagged in-camera. Photos taken with regular digital cameras – sometimes our best photos and most precious memories – lack geotags. This is where geotagging solutions like HoudahGeo step in. Geotags can be added using different methods. The easiest way is to provide a track log from a GPS device. In HoudahGeo, geocoding is automatic when a track log is supplied. Alternatively, HoudahGeo lets you use reference photos taken with a smartphone or pick locations on the built-in map. To permanently attach the geotags to your photos, HoudahGeo writes future-proof EXIF and XMP tags to JPEG and RAW image files. Just like a GPS-enabled camera. HoudahGeo’s sharing options include creating Google Earth KML and KMZ files from GPS tracks and photos.